In the 1980s, free enterprise ideologues often presented Japan as a model of social harmony and economic dynamism. The essays included in this Notebook describe the real situation of postwar Japanese workers and unravel the mechanisms of the apparent Japanese consensus, in many cases akin to authoritarian suppression of independent thinking. 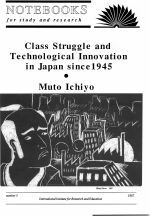 Moto Ichiyo explains how the strategic choices made by the labour movement in the 1950s and '60s laid the basis for the later rightward shift. In the framework of a Marxist analysis, he deals in original and dialectical fashion with the changing relations between the US and Japan, the links between the Liberal Democratic Party and the masses, and the effects of Japanese-style rationalization (gorika) on workers' power on the shop floor. Moto Ichiyo is a collaborator of the English-language periodical AMPO: Japan-Asia Quarterly. As both participant in and witness of the rise, decline and crisis of the Japanese New Left, he has written many articles about the situation in Japan: the politics of the regime, various popular struggles and the labour movement. Some Notebooks are available for download, click on the desired Notebook to get a description. Citing from notebooks are completely allowed as long as the source is mentioned. We sell the hard copies of the Notebooks. If you are interested in buying a Notebook please contact us via the contact form to the right or visit our online shop. Click on the Notebook for a summary. No 50 New Parties of the Left – Experiences from Europe Daniel Bensaid, Alain Krivine, Alda Sousa, Alan Thornett et al, May 2011 (€9, £7, $12). No 52 Capitalism - Crisis and Alternatives Ozlem Onaran, Michel Husson, John Rees, Claudio Katz et al., Summer 2011 (€8, £7, $11). No 54 China's Rise: Strength and Fragility Au Loong Yu with contributions from Bai Ruixue, Bruno Jetin & Pierre Rousset, 2012 (€26 Europa, €32 outside Europa). Leon Trotsky, Daniel Bensaïd, John Riddell. Piers Mostyn, Alf Filer, Dave Rosenburg. Dangerous relationships, Marriage and divorces between Marxism and feminism, Cinzia Arruzza, Penelope Duggan. Camile Dagher, Cinzia Nachira, Roland Rance. Denise Avenas, Michael Löwy, Jean-Michel Krivine. Ernest Mandel, Özlem Onaran, Raphie de Santos. in 1949. 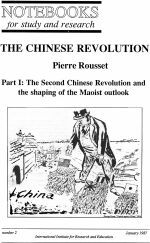 Rousset invites readers to join in collective reflection on the historical constraints that revolutions face and the means of coping with them. Pierre Rousset was born in 1946. He has been active on the French left since the 1960s and participated in many solidarity campaigns with national liberation struggles, particularly with Indochina and other Southeast Asian countries. 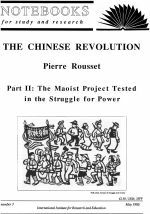 He has produced several studies on Vietnam, in-cluding two books, Le Parti communiste vietnamien (1975) and Nationalisme et Communisme au Vietnam (1978), and the essay 'The Peculiarities of Vietnamese Com-munism' in The Stalinist Legacy (1984). 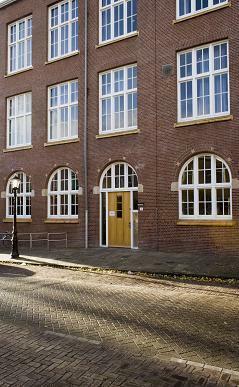 He has travelled extensively in East Asia and regularly contributes articles on the region to several periodicals. He is an IIRE Fellow and former director.